University president, lawyer and community leader, William C. Friday was born July 13, 1920, in Raphine, Virginia. His accomplishments have been critical to building the University of North Carolina System. Junior Achievement He attended Wake Forest university before graduating from North Carolina State in 1941 with a bachelor of science. During World War II, he served in the U.S. Navy from 1942-46 as a lieutenant. He then returned to law school, receiving his law degree from UNC Chapel Hill in 1948. 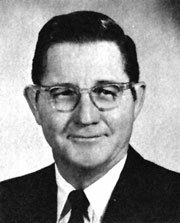 From 1948 to 1951, he served as Assistant Dean of Students at UNC Chapel Hill, including being the Acting Dean during 1949-50. From 1951-55, he served as Assistant to the President at UNC Chapel Hill and then as Secretary to the university in 1955. He became Acting President and then President of UNC Chapel Hill in 1956. William Friday served as president of the UNC system during tremendous multi-campus growth during the next 30 years until his retirement in 1986. He served on boards for Davidson College, the North Carolina Children's Home Society and many other organizations. Bill Friday serves as host of the weekly North Carolina People airing on public television stations. He married Ida Willa Howell from Lumberton in 1942.